Biomedical Applications of Graphene and 2D Nanomaterials provides a much-needed reference on the biomedical applications of 2D nanomaterials, as well as theoretical knowledge on their structure, physicochemical properties and biomedical applications. Chapters are dedicated to growth areas, such as size and shape-dependent chemical and physical properties and applications, such as in diagnostic and therapeutic products. 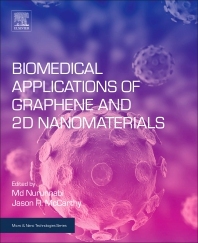 The book also discusses the concept, development and preclinical studies of 2D nanomaterials-based biomedical tools, such as biosensors, artificial organs and photomedicine. Case studies and reports form the core of the book, making it an ideal resource on potential applications in biomedical science and engineering. This timely resource for scientists and engineers in this rapidly advancing field features contributions from over 30 leaders who address advanced methods and strategies for controlling the physical-chemical properties of 2D nanomaterials, along with expert opinions on a range of 2D nanomaterials that have therapeutic and diagnostic applications. Dr. Md Nurunnabi is a Research Fellow of Radiology at the Center for Systems Biology and Cardiovascular Research Center at Massachusetts General Hospital (MGH), Harvard Medical School (HMS). Dr. Nurunnabi’s research interests lie in Nanoengineering in Medicine, with a focus on developing novel approaches for delivering therapeutic molecules. His current research focuses on cardiovascular nanomedicine, stroke and myocardial infarction and targeting therapy and imaging of fibrosis. He completed his PhD in Nanoengineering and MSc in Chemical and Biological Engineering from Korea National University of Transportation in South Korea, and was a postdoctoral student at Chungnam National University in Korea prior to moving Boston. He also co-founded KB BioMed Inc, a South Korea based start-up company which develops commercial pharmaceutical products for therapeutic purposes using nanotechnology.His research has been included in 40+ peer-reviewed articles and 4 book chapters, and has been presented in over 30 scientific conferences worldwide. Dr. Jason R. McCarthy is an Assistant Professor in Radiology at Harvard Medical School and an Assistant in Chemistry at the Massachusetts General Hospital (MGH). In 2003, Dr. McCarthy received his Ph.D. in Inorganic Chemistry at the University of Connecticut under the tutelage of Dr. Christian Bruckner. Following graduate school, he joined the Center for Molecular Imaging Research (CMIR) at the MGH as an NIH Ruth L. Kirschstein National Research Service Award post-doctoral fellow, under the direction of Dr. Ralph Weissleder. In 2006, Dr. McCarthy was promoted to faculty at CMIR, subsequently joining CSB in 2009. The research being conducted by the McCarthy group at Centre for Systems Biology (CSB) is currently funded by several NIH grants and contracts, and is focused upon the synthesis and application of nanomaterials in the imaging and therapy of disease.